Light a candle, pour a glass of wine, sit back and relax while this bath bomb naturally hydrates, heals and nourishes skin. An aromatherapy blend made in house releases a cleansing, calming and uplifting aroma. Our fizzies are made to provide you with a relaxing and soothing bath experience without harmful dyes and chemicals. This means that the fizzing will not be rainbow colors nor will the fizz bubble around the entire bath. It creates a super moisturizing, fizzy bath with bubbles and botanicals using the most natural, skin healthy ingredients possible. An accurate representation of the bath water after the bath bomb has fizzed out is in the photos above. Enjoy! 🌿 Witch hazel has the ability to fight acne, treat damaged skin and reduce inflammation while still providing essential nourishment. 🌿 Cedarwood is emotionally grounding and cleansing while grapefruit is uplifting and the aroma is completed with lavender known for being the ultimate relaxation oil. 🌿 Sweet almond oil is incredibly moisturizing leaving your skin soft and smooth. 🌿 Natural clay absorbs impurities, leaving your skin with a youthful, natural glow. 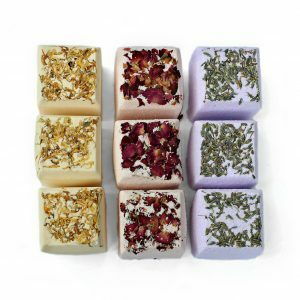 Ingredients: Grapefruit Essential Oil, Lavender Essential Oil, Cedarwood Essential Oil, Witch Hazel, Sweet Almond Oil, Cornflowers, Rose Petals, Natural Clay, Baking Soda and Citric Acid. TO USE:Fill up your bath, light a candle and prepare to relax. Toss in the bath bomb and hop in to experience the natural goodness our bombs have to offer. Be careful when getting out of the tub, oils released from the bath bomb may leave the bottom of your bath a little slippery. Use within one month of purchase for maximum effect.